As an industry we have developed an elevated awareness and greater sensitivity towards Bio security than ever before. We suit up, wash up and disinfect – requesting a strict bio security protocol for suppliers with the expectation that this protocol will reduce the potential spread of infectious diseases. Despite our extensive efforts, you know all too well that diseases still challenge our swine facilities. This said, whether you are a Farrow to Finish, Sow to Weaner, Nursery or Finisher producer, some diseases are so spontaneous and seem to pop up out of thin air – often when you’re least expecting it and are least prepared. The resulting affect can be devastating and can impact growth rates, morbidity numbers and your financial success as a producer. In your day to day management, you will have become familiar with most of these diseases. Adapting your management style to handle the intrusion of looming unwanted diseases is a valuable skill and is often undervalued. Being educated and aware of the symptoms of potential problems is a good strategy and having a response plan in place is always the right choice. 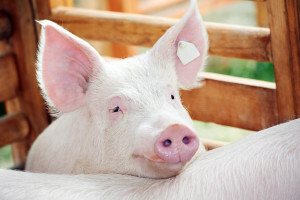 Diseases can be seasonal or can be related to factors out of your control such as suppliers, issues with vaccine or vaccination protocol, less than ideal transportation of pigs from one facility to another, poor previous living conditions, improper climate control of a facility, poor quality feed or lack of a access to a clean water supply. Regardless of the nature of how disease raises its ugly head “it just does” and certainly of late it seems to be getting more complex than ever before. Old tried and true methods of treatment don’t seem to do the trick or have less impact on the treatment and prevention of disease. We are seeing a change in the medications used to treat Strep and Enteric issues; Penicillin / Pot Pen for treatment of the Strep family of diseases has migrated towards Amoxicillin. Loose manure and enteric issues have moved towards using Avilosin. The most successful treatment to any infection or disease is prevention. Good facility management can stop the spread and reduce the risk of future outbreaks. I’d like to suggest you try not to overstock pens; this will increase feeder space per pig. Group pigs by size and age at weaning and reduce re-sorting as much as possible. One commonality I see in most facilities is the lack of aggressive action of “a” Identifying a sick pig in a pen and “b” doing something about it. At times these pigs are ignored, marked or pulled out to a recovery pen (sick pen), where it is medicated and left for nature to take its course. We see lots of recovery pens where these pigs spend their last days. The more pigs we collect in a recovery pen, the higher the disease level becomes in the barn. In my opinion we could reduce the impact of disease considerably by giving the treated pig a chance. If it doesn’t respond, make plans and act upon them. Provide relief to the suffering pig humanely or, when outside of the withdrawal date and it is physically fit to walk on a truck, move it off your farm. Pigs that are fully recovered should re-enter in the main flow. Manage the recovery pen for what it is designed to do (recovery) and you should see a reduction of disease interference in your facility. Generally today’s producers are reaping the rewards of improved production and average health of their barns – phenomenal average daily gains and great feed conversions in nursery/finishers are evidence of this. Reducing the risk and impact of disease can be achieved by implementing a high level of barn management, strict on-farm biosecurity, ensuring access to proven nutrition, clean fresh water and closely monitoring your herd and its environment for first signs of illness. To reduce the risks associated with health challenges at your facility, understand trigger points and put strategies in place to manage these factors. Consult your veterinarian when needed and implement appropriate medication and isolation protocol. When recovery appears to be bleak, reduce the risk for the entire barn by humanly removing the sick animal from the facility. In closing, I challenge every producer and facility manager reading this article to rethink their protocols around recovery pen management.